God is love. Before the creation of man, the world has already been prepared in advance by God. Everything that will sustain life is already made available beforehand. Creation has been formed only through the words of God. When He spoke, everything came into existence out of nothing. It was only man that has been created through the dust from the ground formed into a being. God breathed into his nostrils the breath of life. Adam has been given the divine authority to rule over creation. In fact, God authorized him to name every living creature or animals – the birds, fishes, and the land animals. Whatever he called them became their name. However, there is no suitable companion for Adam out of all creation. It is not good for him to be alone. He needs a help mate for him. So, God caused him to sleep deeply and took one of his ribs and formed into a woman. God is love.When mankind is created, they are naked and covered in the divine glory of God. They are not ashamed or embarrassed in any way. God gave them a commandment not to eat from the tree of the knowledge of good and evil as they will surely die. Every fruit of the trees in the Garden of Eden can be eaten to nourish and nurture them except the fruit of the forbidden tree. However, the serpent (satan) tempted Eve to eat the forbidden fruit questioning her about God's command. Eve was deceived into believing that she will become like God. He ate some of the fruit and even gave Adam as well. Consequently, their eyes were opened and they realized that they were naked so they made fig leaves as coverings in their bodies. They were filled with guilt and shame because of their disobedience to the commandment of God. But, God clothed them with tunics of animals to clothe them. Man became separated from God henceforth needing a Savior to reconcile them with God. God is love. He provided a way when mankind is separated from Him during Adam and Eve's fall and sin. Since the Old Testament, there is a foreshadowing of the coming of a Savior that will reunite mankind to God for them to live with Him for all eternity. In the New Testament, Jesus was born and He lived and died on the Cross to pay the penalty of all our sins. To those who will receive Jesus as Savior and Lord in their hearts wholeheartedly, they become the sons and daughters of the Most High God. Our filthy rags or sins are cleansed and we are now clothed in the righteousness of Jesus. God is Love. After putting on Jesus and His righteousness, God's love permeates our entire being, spirit, soul, and body. We are filled with God's love and we will love Him in return and others also. 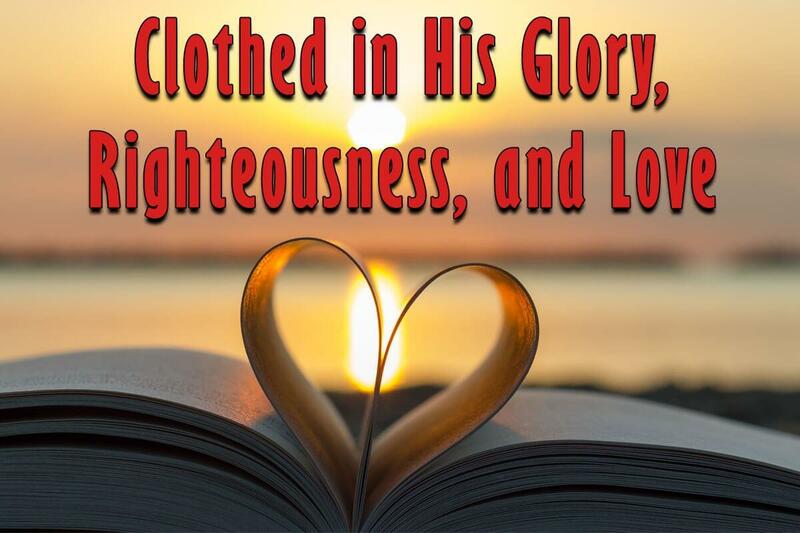 God is Love Clothing demonstrates that we are clothed with God's glory, righteousness, and love. Oftentimes, we are proud of wearing brands that are famous and expensive. God is Love Clothing is a new alternative to express our love and faith in God through Christian apparel. Wearing one of our t-shirts tells the world that we are not ashamed that our hearts belong to God. No more fig leaves, animal skins, and ungodly clothes but clothes that promote and glorify God.